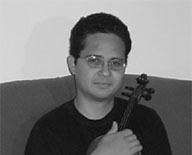 He started studying viola in Mexico City at the music school “Ollin Yoliztli” with Bodgan Zawiztowsky. In 2001 he obtained his diploma “Estudio Superior de Musica de Camera” in Mexico City under the guidance of the ‘’Cuarteto Latinoamericano’’, and in 2007 the Master in Music Pedagogy for viola at the Conservatorio della Svizzera Italiana with W. Christ and G.P. Guatteri. Later he attended the post-formation course with B. Giuranna. For seven years, he was member of the String Quartet Nauhyotzin with whom he took part in different chamber music courses with internationally renowned quartets such as Ying Quartet, Tokyo Quartet, Penderecki Quartet, Shanghai Quartet, Melos Quartet, Saint Petersburg Quartet, Lark Quartet, Amernet Quartet. With this ensemble, he was awarded the second prize at the International Chamber Music Competition “Cervantes” (the most important in South America). In 2001 the ensemble was invited to play concerts in Nizza and Paris. He also attended masterclasses with Eugene Becker, first viola of the New York Philharmonic Orchestra, and summer courses with Robert Cohen, Norbert Brainin and Carlo Chiarappa. In 2006 he played as first viola in the “Junge Philharmonie Thüringen” with Ivo Pogorelich as soloist. Since 2007 he has been viola and chamber music teacher at the music school of the Conservatorio della Svizzera Italiana.